Thanks for your prayers. It’s been a busy week with my puppy, Addie. I forgot how much work new puppies are. But she’s been a joy to have and she is starting to connect the dots that her potty stuff needs to go outside. Oops, maybe I spoke too soon, another accident this morning. This week’s question: My counselee is separated from her verbally, emotionally, and sometimes physically abusive husband. Courts are not involved. They have a four-month-old baby. Husband wants to see the baby but uses time not to be with the child but to abuse the wife. The wife is discouraged and uncertain about how to proceed. I’m helping her work on CORE and her emotions. Help!!! Answer: Thank you for your question. I suspect there are a lot of counselors, both lay and professional, with big hearts who aren’t exactly sure what to do when encountering these kinds of situations. Your first goal with your counselee is to help her establish safety for herself and her child. From what you report, this is not happening as your client is continuing to be abused when the child’s father visits. Let me ask a few questions. You mentioned that those courts are not involved. If there has been physical abuse, then why not? Is she continuing to be physically abused when he visits the child? Sexually abused? If so, she needs help in calling the police and pressing charges and getting a protection from abuse order. Sometimes Biblical counselors or other well-meaning Christians believe that it is wrong to involve the secular authorities in family situations, even when there is abuse. However, Paul makes a clear distinction in Romans 13 that the secular authorities are given to us by God for our protection from evil doers (Romans 13:4). Paul himself appealed to the secular authorities when he was being abused and unjustly treated (see Acts 25,26). A legal protective order would give her some clear boundaries around visitation and some clear legal consequences if her spouse violated them. Has this been suggested and if not, why not? Second, has she seen a lawyer to understand her rights and responsibilities regarding visitation and support for her child? If not, she needs to do that as soon as possible. If she can’t afford one then help her make an appointment with her local domestic violence organization as they often have lawyers who will do a pro bono consultations or the volunteers at the shelter are familiar with the laws in their county and can help her make a safety plan. At the very least, together with her, call the Domestic Violence hotline to ask them to help you and her establish a safety plan. Their phone number is 1 800 799 SAFE. Her husband may be manipulating or bullying her by threatening that she will lose custody of their child, making her afraid to have boundaries or speak up. If there is no court order for visitation yet, why is she allowing her husband into her home at all? 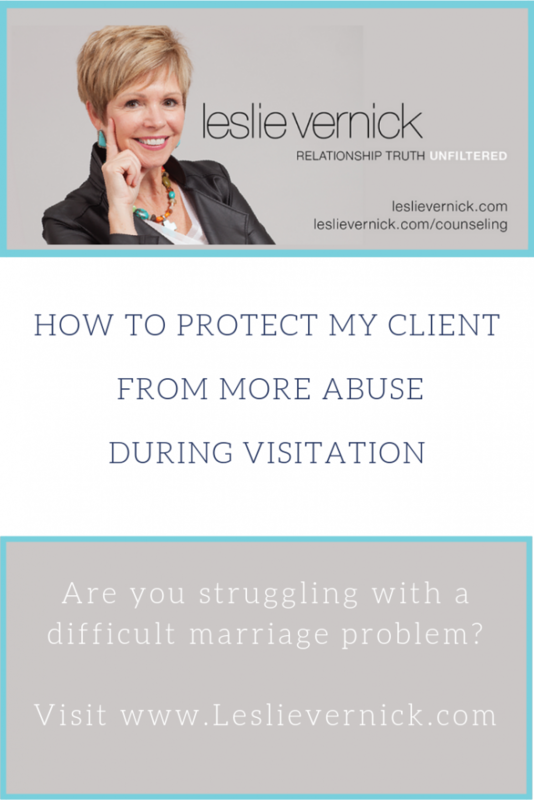 Obviously sooner or later there will be some court-ordered visitation, but she is not required to do so right now, so what’s going on that she’s putting herself in harm’s way by allowing him to come to her home to continue to harass and abuse her? If the church is involved and trying to manage this case without legal help, you can see how absolutely impotent they are to protect her. That’s why God has given us legal authorities to turn to (and sometimes they are also unable to truly stop a determined person from doing harm). If you are a church counselor, please encourage her to involve the law now. This is always her choice but if she feels pressured by the church to “stay away from the secular authorities” she may only put herself in more danger. The church is neither equipped nor knowledgeable enough in such situations to navigate through these turbulent waters in a wise way. If the church is involved, one way that they can help her right now is to make sure someone from the church or one of her family members is always with her when her spouse visits the child. He is less likely to abuse her in front of someone. If he comes over because he wants to spend time with his child, then he can do so at determined times (not whenever he feels like it). Having a third party present gives him the opportunity to be with his child but not abuse his wife. If his true intent is to abuse his wife, he’ll stop showing up when he realizes he doesn’t have access to her. However, if a church or family member doesn’t feel safe being there, then that indicates even greater danger for her. Safety for your client and her child are your #1 treatment goals right now. She can’t even get out of crisis mode when she continues to be abused, frightened, and re-traumatized. Educate her on trauma bonding and help her establish no contact so that she has space to heal. Imagine yourself having to spend time in a room with someone who had abused you and is abusing you now? Pretty hard to think clearly. You’re terrified for yourself and your child over and over and over again. This is not good for her or for the child. It’s not possible for her to be in CORE when she is in flight, fight or freeze mode. Please help her to develop and execute a safety plan, which is going to involve legal authorities for her protection. Friends, what other suggestions would you have for this counselor to help her client get safe? Excellent post and response,Leslie.This woman and her baby need the protection of the courts.Reminds me of Dr Henry Clouds definition of people as wise,foolish,and evil( I know he got this from the Bible) With evil people you stop talking and use “ guns,lawyers and money”.First things first and that is her safety.As Christian women we are often encouraged to be accommodating and “sweet and nice”.The kindest thing for this man is to be served an order of protection and only be allowed court supervised visits with his baby.This is the sad reality he needs to see,that his evil behavior has caused these consequences.Praying that this woman’s counselor will heed your advice.So thankful for your wisdom and clarity in speakly into such brokenness and caring deeply for all who God brings to you through your ministry.I have learned so much from this site and know the Lord led me here. Hi leslie! Everything you said is right on target. Safety comes first for this mom and child. The mom is reaching out for help and this sounds very serious. I pray God will bring a safe person to be with her during this crisis. Leslie you are the Bright Light in so many women’s lives. I thank God for you. All Glory to Him! First of all I think it’s good that the counselor is supporting the mother and child rather than pushing for reconciliation at any cost. Working on CORE and emotions is good, too, but I agree with Leslie that safety has to come first. My guess is the abuse is worse than what the mom has revealed. It’s common to only share parts of the abuse story because we feel ashamed or guilty or have other beliefs that make us keep silent. All the more reason to involve the courts if possible to get some legal protections in place for the mom and baby. I have a hard time believing that this man sincerely loves his child because if he did, he wouldn’t be abusing the baby’s mother. I hope and pray for wisdom and protection in this difficult situation.